> information are approximately 31% in error. > lift that counterweight, using the opposite end. > have 2.5 feet on on end, it drops down to 5 men. > over your head. How is that accomplished? Here, specifically, a number of erroneous assumptions regarding the ”means and methods” have been made. Petrie (Corrected Great Pyramid Course Elevations and Plate 8) illustrates the largest course of the Great Pyramid, above the base courses, is the 35th (+/- 49.5 inches thick average). 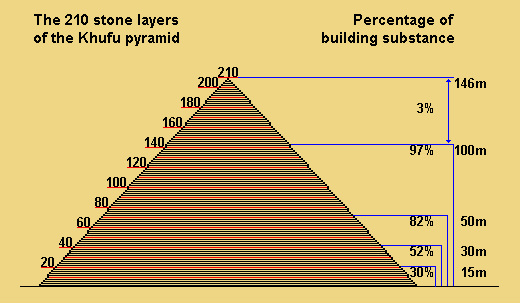 This course represents approximately 50% of the stone required for the entire Pyramid’s construction. Likely to this level earthen and mud brick ramps were utilized to maneuver (‘lift’) the bulk of the large core and casing stones. Above the 35th course, the majority of the stone units are approximately one (1) cubit high [Petrie] and weigh approximately one (1) ton [see Smith’s ratio, h:w:l = 1.0:1.33:2.0 cubits]; approximately 45.77% less than the speculated 5,000 pounds above (”…5,000lbs. (2.5 tons)…” The employment of ‘Shadfu crews’ (assuming the application) would have been most productive above this level. Regarding these proposed Shadfu crews, the presumption of a single crew, of any size, is lacking; as is the area of the necessary staging zones (”…steps…only 2.5 - 3.0 feet wide…”). Two (2), perhaps four (4), crews (working on two levels of +/- 1 cubit apart vertically) could potentially operate independent machines on a single stone, simultaneously. Staging zones, placed strategically, would enable transportation at numerous locations on the structure.